Bollywood actor Abhishek Bachchan is busy in the shooting of his next film Manmarziyaan directed by Anurag Kashyap and yesterday the makers revealed the first looks of the leading actors from the film. 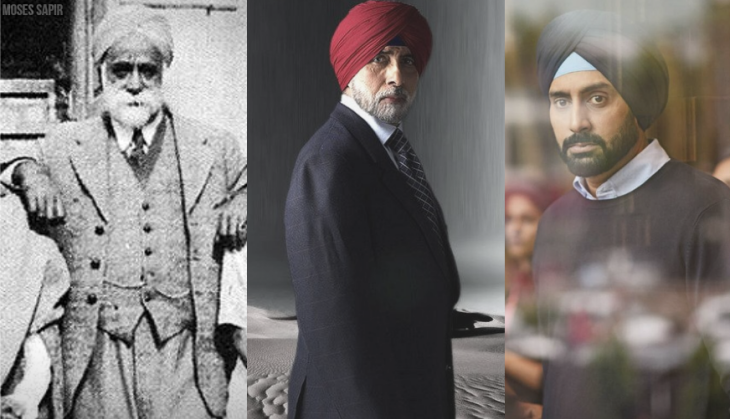 In the looks, Abhishek Bachchan could be seen in the role of a Sikh and now this picture of Abhishek is getting appreciated. When Big B, Amitabh Bachchan saw this picture of Abhishek as a Sikh he got emotional. The film 'Manmarziyaan' is going to release on 7th September 2018. In this picture, Abhishek can be seen having a turban on the head and a long beard. Now sharing this picture on social media, Big B tweeted, "T 2750 - Manmarziyaan .. Abhishek Bachchan .. your Daadi, Teji Kaur Suri pre-marriage .. your par Nana Khazan Singh Suri .. your par Naani Amar Kaur Sodhi .. & all related must feel great pride and love for you .. as do I .."
This is to notice that for the first time in his career Abhishek Bachchan is playing the Sikh character, however, he earlier has supported turban in Happy New Year but for one song. Manmarziyaan is being produced by Aanand L Rai and the film is being directed by Anurag Kashyap. The film will star Abhishek Bachchan, Vicky Kaushal, and Taapsee Pannu in lead roles. Earlier Abhishek told that he is facing the camera after a long break of 2 years.